CHARLESTON, SC - Are you in need of rejuvenating, relaxing your mind and body and finding your inner peace? If so, then visit Joseph P. Riley, Jr. Park on Saturday, September 6. We're not talking about a RiverDogs baseball game, but "Downward Facing RiverDog" yoga on the field. 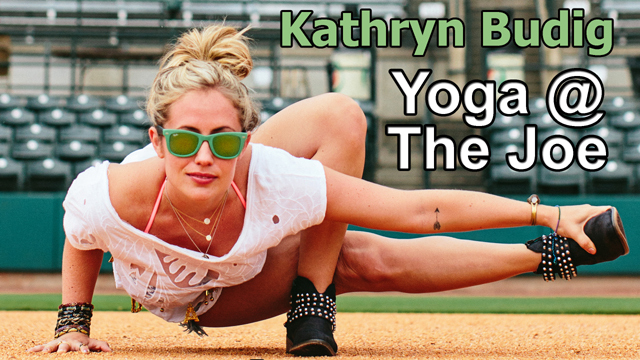 Led by internationally-acclaimed instructor Kathryn Budig, the Charleston RiverDogs will host "Downward Facing RiverDog," a yoga class that will be held on Riley Park's emerald green grass. From the downward facing dog post to the firefly pose, all levels of yoga are welcome. "The class will be playful and accessibly challenging," says Kathryn Budig. Tickets are $10 in advance and may be purchased online at rileyparkevents.com or at the Riley Park box office. Tickets are $15 at the gate. Gates open at 9 am, Class from 10-11 am. Downward Facing RiverDog will benefit "Poses for Paws," an organization co-founded by Budig that is dedicated to raising money for animal shelters through yoga. Budig trained and taught yoga in Los Angeles for eight years under the guidance of Maty Ezraty and now travels the world. Her playful mixture of challenging classes with her positive personality is the recipe for a truly inspiring class. As an avid food lover, she is also passionate about sharing healthy, organic and eco-friendly recipes. Budig shares her zest for life, yoga and food as the Women's Health Magazine yoga expert along with her contributor writings for The Huffington Post, Yoga Journal, Gaiam, The Daily Love and MindBodyGreen. She's been seen on the covers of Yoga Journal, Yoga International, Om Yoga and Common Ground. Budig has been featured on E! Entertainment, The Food Network, Forbes Women, The Wall Street Journal and The New York Times. She also serves as the brand representative for ToeSox and is currently sponsored by Under Armour + ZICO Coconut Water. She authored Rodale's The Women's Health Big Book of Yoga. After the class, participants will be able to enjoy mimosas, Bloody Marys and live music by Estee Gabay in vendor village. For more information, please contact the RiverDogs at 843/577-DOGS (3647) or online at rileyparkevents.com.